The ATO Tax 2013 app puts tax help in your hand at tax time. Available through Google play™ and Apple App Store, you can use the app on your smart phone or tablet to view income tax rates for this year. And use our tax withheld calculator to work out how much tax you pay. After you lodge your tax return, you can use the app to check your tax return’s progress. The app includes links to helpful tax information and a list of hot tax topics to help you at tax time. 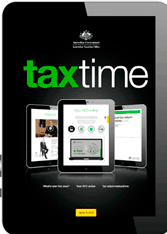 This year, we’ve released a new digital magazine called taxtime. Taxtime is for tablet devices and will give you the information you need to do your tax. * links to tools and calculators to help you prepare your return. taxtime is not available for smart phones or desktop computers. If you do not have a tablet device, visit ato.gov.au/instructions2013 to read the instructions and find out what’s new in 2013.